Push notifications are sent to a user’s device from mobile apps to keep the dialogue going between brand and consumer. There is a common misconception that this type of notification is spam but this is only down to the few who are abusing the privilege of the personal marketing channel. The majority of UK brands haven’t cottoned on to the marketing benefits of push technology. As long as it isn’t misused, push technology is an effective way to engage customers and drive brand loyalty. These figures show, when used effectively, push notifications achieve higher engagement results than popular channels like email. The key to getting notifications right is giving customers information they want. When a push notification is sent to a user’s device, their day-to-day activities are being interrupted. If the message doesn’t add value to the user’s day or include a compelling CTA, you aren’t going to draw them in. Many marketers aren’t aware of what you can do with push technology, below are a few examples of how you can use push notifications to engage and retain customers. Users should be educated on push notifications as soon as they open the app. Give users the decision to opt in or out of notifications, and those who opt-in can be directed to define their preferences further. For example, users might want to receive the latest football results but not the latest cricket results. Letting the user choose which notification types they want to receive will make them more likely to opt-in. As long as you are sending users relevant messages that add value, they will be willing to be interrupted. It’s the irrelevant, non-targeted push notifications that are forcing users to opt out and uninstall apps. Geo detection allows marketers to find out where users spend the majority of their time. You can even find out location details for specified periods of time. Retailers can use geo detection to find out when a customer last visited their store or when a customer is nearby, and then you can push out a relevant notification: “Come inside for a free glass of champagne while you shop!” or “Get 20% off when you’re next in store”. As well as using in-app analytics, you can also integrate your app with CRM systems to gain data on your users. This means audiences can be narrowed down into different user groups based on historical habits. If a certain group of users frequently purchase books by a specific author, you can send out a targeted push offering a discount on the author’s latest title. As well as targeting the right customers, you also need to deliver relevant information to the user. Many people are unaware that as well as text notifications, you can also send out rich media content to engage your users. A recent example of relevant, rich media content being sent out to users through push comes from the London 2012 Join In app. This offers attendees information on all of the Olympic celebrations happening across the UK. The app includes full event listings, searchable maps, alerts and the ability to share location pins with friends. Head of new media for London 2012, Alex Balfour, mentions in his Olympic digital report that 60% of online visits came from from mobile devices and apps, leaving the web behind in terms of average page views per visit. The app sent out more than 10 million location-based push messages to users in the stadium and at other Olympic venues. Push notifications included ceremony photos and upcoming events. Nearly 60% of app users enabled location-sharing and location-based pushes achieved clickthrough rates of around 60%; nearly ten times higher than clickthrough rates for games-related emails. These stats go to show that timely, relevant and location-based push notifications can achieve a high level of engagement with users. It’s the notifications that arrive at 3 o’clock in the morning with no purpose that are driving users away. Push notifications are becoming an incredibly powerful communications channel and can be sent even when the user isn’t engaged with the app. Because the channel is so personal, it’s easy to take advantage of it. Brands need to ensure they are interrupting their mobile customers to add value to their day, not to disrupt it. Yesterday, the IAB released new research in connection with Meredith’s Parents Network surveying moms with school age children on with use of mobile during the back to school season. I know that back-to-school creates great mobile opportunities for brands and retailers to reach busy moms at a pivotal time. This study with Meredith points to a variety of ways that busy moms depend on their mobile devices in order to get through the hectic back-to-school season. The way we access the internet is shifting fast. This change is good: It has dragged me and many other designers back to desktops creaking under the weight of conservative ideas that need cleaning out. 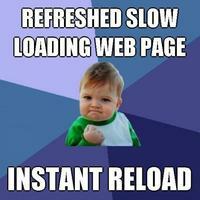 Still, despite good intents and considerable efforts, many websites end up overloaded with graphics.